Heat olive oil in a large frying pan over a medium flame. Add the sliced onion, yellow bell pepper and pasilla chili pepper. Mix to combine. Sprinkle with garlic powder, oregano, and seasoned salt. Mix to combine. Sauté for 20 minutes, mixing on occasion, then add in the mushrooms. Cook for an additional 10 minutes. Set to the side. Stick a slice of pepper jack cheese into the center of each tortilla and fold one of the edges over to form the shape of the taco. Place the tortilla on a hot comal or griddle over a medium flame and allow the cheese to melt. Cooking on each side allowing for the outside of the tortilla to get crisp. 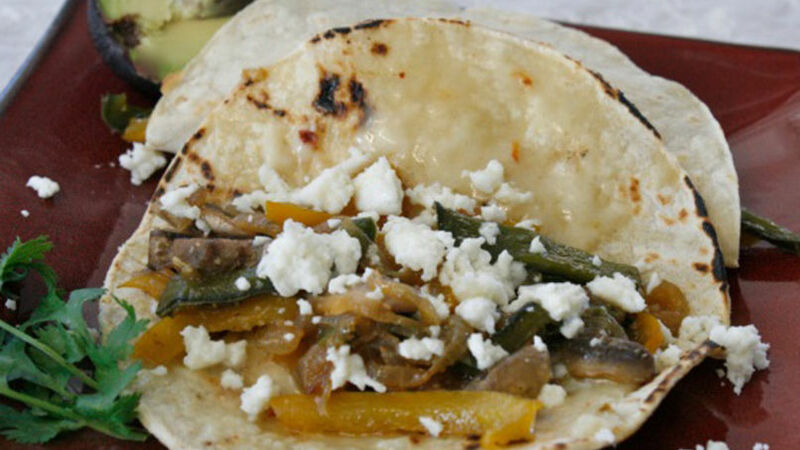 Remove from the comal and fill each tortilla with a heaping spoon full of veggies. Top each taco with queso freso. Serve with avocado slices, cilantro and salsa. Enjoy! Heat tortillas over open flame before adding in the cheese to melt the cheese. This keeps the tortillas from breaking and keeps them firm. My mother is a vegetarian, and many dishes in my home have been altered to fit her diet. I move mountains to make her our beloved Mexican cuisine sans the meat. One of the dishes she loves best is veggie tacos. It’s sort of a hybrid between a quesadilla and a taco, and is garnished with queso fresco and avocado. They are seriously simple to make and my momma just loves them!